Twenty-two years ago today, South Africa and the world were forever changed when Nelson Mandela, revolutionary leader and former political prisoner, was elected as that country’s first black chief executive. In doing so, the decades long policy of apartheid was rebuked and the country moved into a new era. Prior to his election, Mandela had been serving a life sentence at Robben Island, Pollsmoor and Victor Verster prisons for his involvement in a conspiracy to overthrow the South African state government. He had served approximately twenty-seven years before his release was granted in 1990 amid growing international agitation and protest against the South African government. 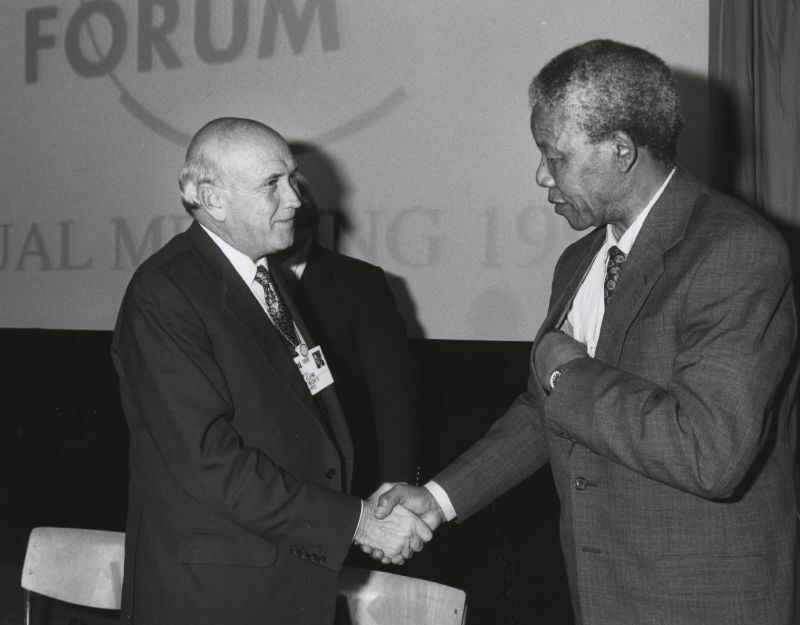 Following his release, Mandela commenced negotiations with then-President F W. de Klerk to abolish apartheid and establish open elections in 1994. The African National Congress (ANC), which had previously been a civil rights organization and was banned for many years under apartheid, thus began to campaign as a political party with Mandela as their candidate for president. The party campaigned with the slogan, “A better life for all” and put forth a Reconstruction and Development Programme platform, which promised to construct one million houses in five years, develop and introduce universal free education, and expand access to water and electricity. Mandela, in his capacity as candidate, extensively toured North America, Europe, and Asia in order to meet wealthy donors, and also met with prominent Afrikaner politicians at home in order to gain cross-party support. As the leaders of the two major political parties, de Klerk and Mandela participated in a mandatory debate and, although de Klerk was considered the better speaker, Mandela’s graciousness and offer to shake de Klerk’s hand at the end had many commentators giving the victory to Mandela. “I watched David [Dinkins, New York City mayor] go over to Mandela and whisper in his ear. I saw Nelson’s head raise abruptly, and he broke into a beautiful smile. “Arthur is here?” he asked, with obvious surprise and delight. “He’s right here,” David said, turning to me. Mandela and Ashe had in fact been fighting the same battle on different continents. Ashe was outspoken opponent of apartheid, protesting the creation of new ATP tournaments in South Africa, and was a co-founder of Artists and Athletes Against Apartheid, an organization that raised awareness for apartheid policies and lobbied for sanctions and embargoes against the South African government. Nelson Mandela will be remembered for his role in peacefully bringing an end to apartheid and bringing a country together, in working from a place of forgiveness to break down racial barriers. His ascendency to the presidency and his inclusive vision of the future forever changed the fabric of his nation.